How many of your users will take the bait and reply to a spoofed email? Highly targeted phishing attacks, known as Business Email Compromise or CEO fraud scams have exceeded $12.5 billion in total known losses worldwide. The bad guys use these social engineering attacks to impersonate your CEO and convince your users, often in Accounting, HR, or even IT into sharing sensitive information. 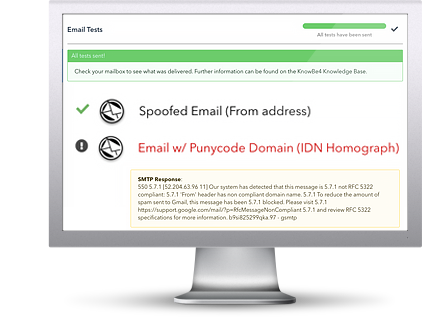 KnowBe4's new Phishing Reply Test makes it easy for you to check to see if key users in your organization will reply to a highly targeted phishing attack. 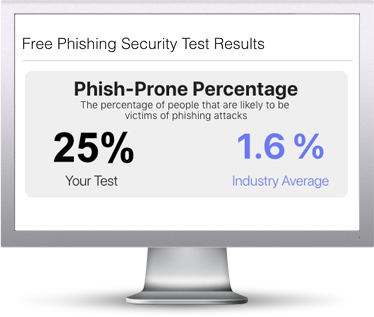 Find out what percentage of your users are Phish-prone™ with your free Phishing Security Test. Why? If you don't do it yourself, the bad guys will. Plus, see how you stack up against your peers with phishing Industry Benchmarks. Start phishing your users now. The Phish-prone percentage is usually higher than you expect and is great ammo to get budget. Highly targeted phishing attacks, known as Business Email Compromise or CEO fraud scams have exceeded $12.5 billion in total known losses worldwide.The bad guys use these social engineering attacks to impersonate your CEO and convince your users, often in Accounting, HR, or even IT into sharing sensitive information. KnowBe4's new Phishing Reply Test makes it easy for you to check to see if key users in your organization will reply to a highly targeted phishing attack. Should they call the help desk, or forward it? Should they forward to IT including all headers? Delete and not report it? 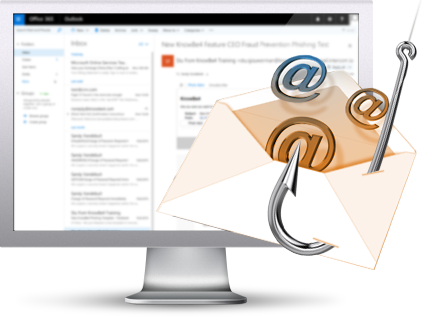 Get the Phish Alert Add-in Button and give your users a safe and easy way to forward email threats to the security team for analysis, all with a single click. Wish your users could "roll back time" when they click a bad link? Now they can! 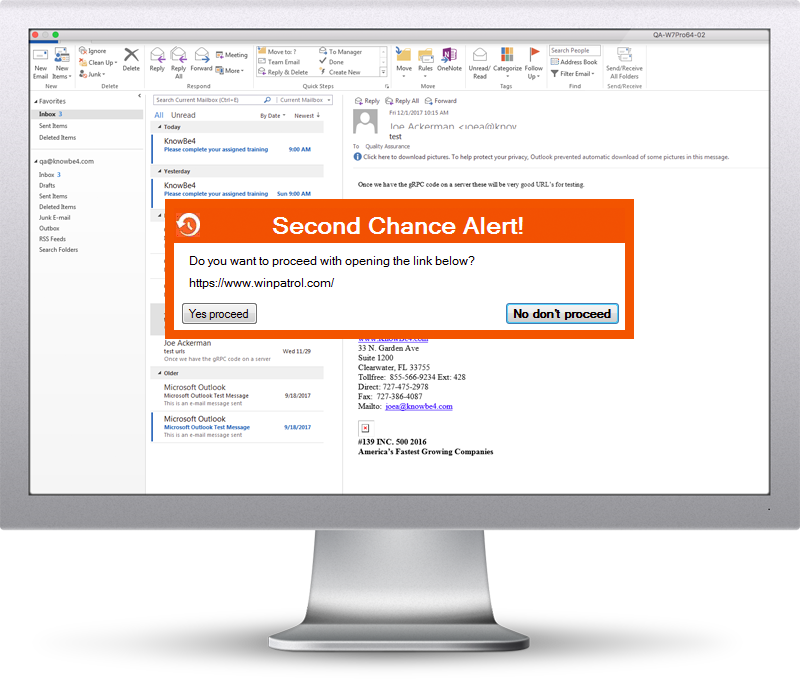 Second Chance enables your user to make a smarter security decision by giving them a way to back out of that click. This tool takes an intelligent look at the clicked URL in an email, and asks your user if they are sure they want to do this, in case they clicked on a potentially unsafe or an unknown website. Get your customized security awareness training program. Many IT pros don’t exactly know where to start when it comes to creating a security awareness program that will work for their organization. 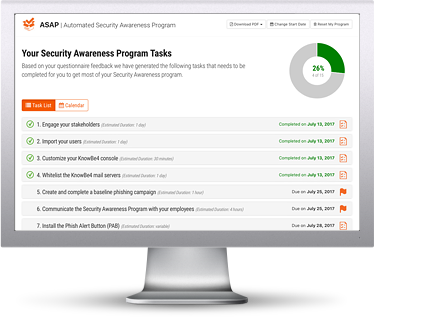 ASAP allows you to build a customized Security Awareness Program for your organization that will help you to implement all the steps needed to create a fully mature training program in just a few minutes. The world's largest library of security awareness training content is now just a click away! 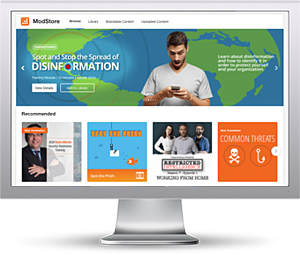 In your fight against phishing and ransomware you can now deploy the best-in-class phishing platform combined with the world's largest library of security awareness training content; including 850+ interactive modules, videos, games, posters and newsletters. Get access to the full library now! A whopping 25% of employees are using the same password for all logins. What if that password is available on the dark web? A massive amount of passwords are compromised due to data breaches and used by the bad guys for attacks. Find out if hacked passwords are being used within your organization. Are your user’s passwords…P@ssw0rd? Employees are the weakest link in network security, using weak passwords and falling for phishing and social engineering attacks. 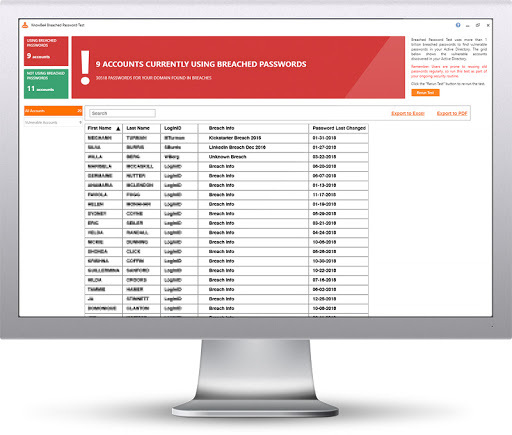 Our Weak Password Test checks your Active Directory for 10 types of weak password related threats, get your report in 5 minutes! Are your users putting a big target on your organization's back? The bad guys are constantly coming out with new ways to hack into your network and steal your organization’s confidential information. 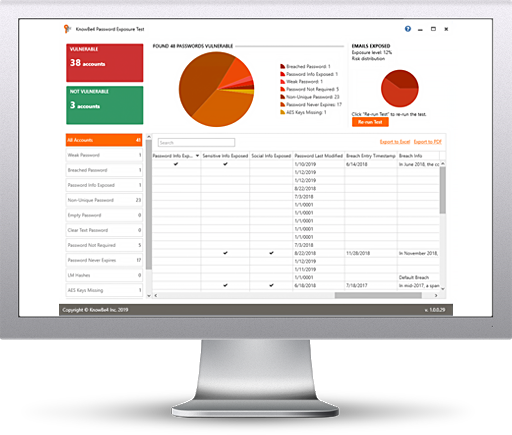 KnowBe4’s new Password Exposure Test allows you to run an in-depth analysis of your organization’s hidden exposure risk associated with your users. 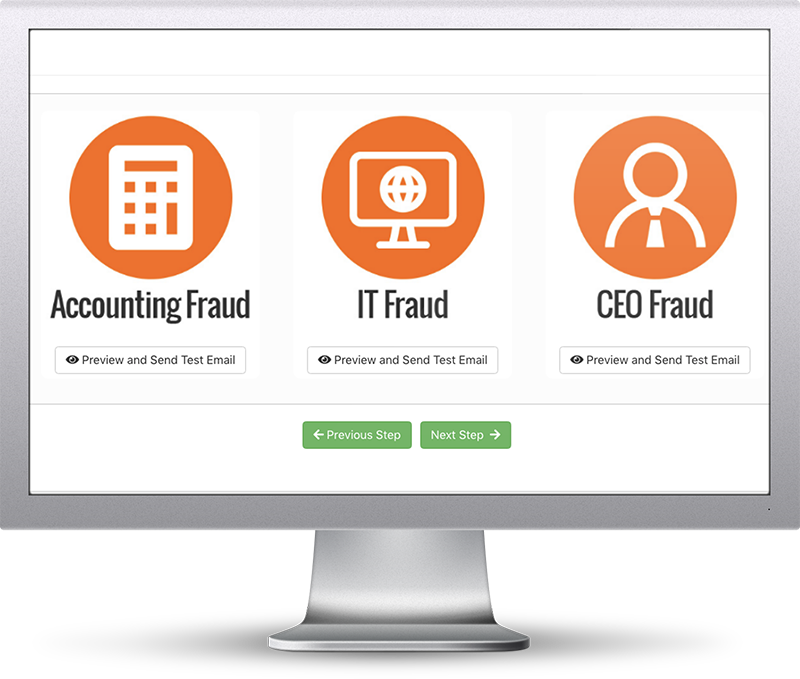 Many of the email addresses and identities of your organization are exposed on the internet and easy to find for cybercriminals. With that email attack surface, they can launch social engineering, spear phishing and ransomware attacks on your users. 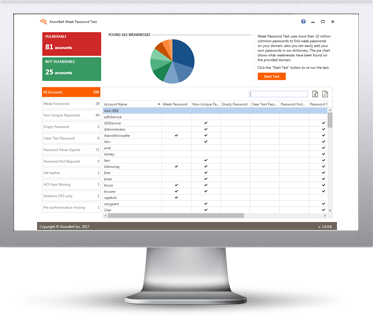 Our Email Exposure Check identifies the at-risk users in your organization. Are you aware that one of the first things hackers try is to see if they can spoof the email address of your CEO? If they are able to commit "CEO Fraud", penetrating your network is like taking candy from a baby. Find out now if your domain can be spoofed. 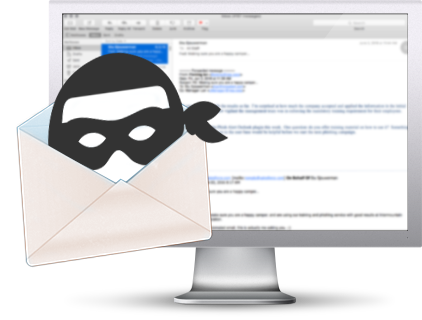 With email still the #1 attack vector, do you know if hackers can get through your mail filters? 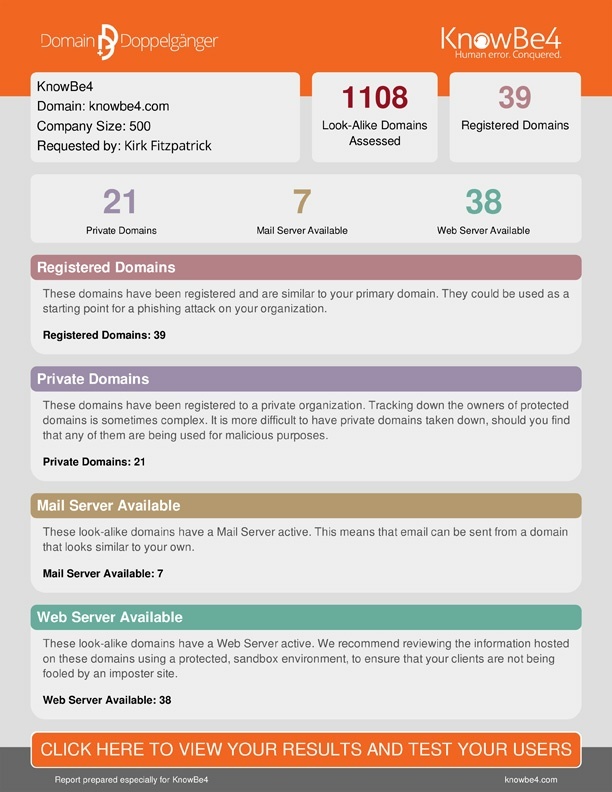 KnowBe4's MSA tool tests your mailserver configuration by sending 40 different types of email message tests that check the effectiveness of your mail filtering rules. Get insight at how your mailserver handles different message types including email with attachments that contain password-protected, macro zipped, and .exe files or have spoofed domains. Since look-alike domains are a dangerous vector for phishing attacks, it's top priority that you monitor for potentially harmful domains that can spoof your domain. 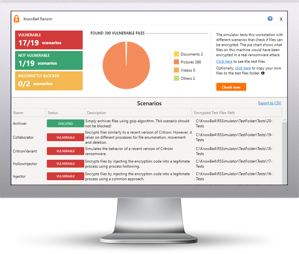 This tool makes it easy for you to identify your potential "evil domain twins" and combines the search, discovery, reporting, risk indicators, and end-user assessment with training so you can take action now. Find out how vulnerable your network is against ransomware and cryptomining attacks. Bad guys are constantly coming out with new versions of ransomware strains to evade detection. Is your network effective in blocking ransomware when employees fall for social engineering attacks? RanSim will simulate 13 ransomware infection scenarios and 1 cryptomining infection scenario and show you if a workstation is vulnerable. Download our special, "beaconized" file onto any USB drive, then label the drive with something enticing and drop at an on-site high traffic area. 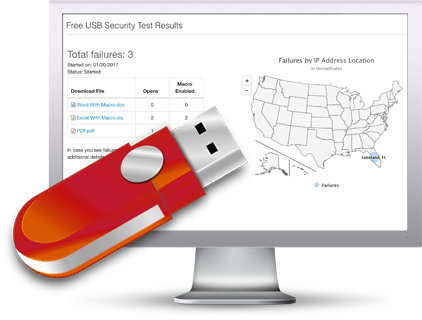 If a user picks it up, plugs it in their workstation and opens the file, it will "call home" and report the "fail" to your KnowBe4 console. Also get reporting on opens and if macros were enabled. Find out now how your users will react!